I don't know if everyone feels the same as me, but I get really excited about interiors at this time of the year. First of all, there's all the gorgeous autumn-toned items and a ton of metallic gold and bronze things, but there's also a ton of Halloween interior items. I've seen so many cute pieces of Halloween-themed crockery and stunning, spooky prints, but there's also a lot of things that include a naked flame. Well, today, I'm going to share 3 Halloween-inspired fairy light hacks, so you can trade out candles for a bit of sparkle. If you live in university accommodation and aren't allowed to use candles, this is the post for you! I'm also pleased to say that the lovely people over at Festive Lights have teamed up with me for this post after they asked me to share my favourite fairy light hacks, so let's get cracking. But first, let me tell you a little bit about Festive Lights. Opening in 1999, this company prides itself on its mission to brighten people's days. They offer a huge range of high quality, decorative lights (that most definitely aren't just for Christmas, as I'm about to show you!) across the world! Their Facebook is an absolute haven for lighting inspo, so definitely check that out. I had a good dig through their website to find that perfect fairy lights for my projects, and let me tell you, there was so much to choose from! They've even got a whole Halloween section - I found it so hard not to purchase every single thing. In the end, I opted for two sets of the Silver Micro Naked Wire Fairy Lights, one in warm white and the other in amber, as they were battery-powered - ideal for what I had in mind! Of course, at this time of the year, it's only right that you get a pumpkin, but the problem with a real pumpkin is that they don't last. I took a trip to the supermarket recently and saw that they were selling pumpkins. I wanted to get one, but I knew that by the time Halloween came around, it would just be mush. So instead, I opted for a plain white, porcelain pumpkin, which I spray painted gold and popped my fairy lights inside. I can have him on display all month and not have to worry about him turning into a spongey mess. Not only will it last a long time, but it also looks great. 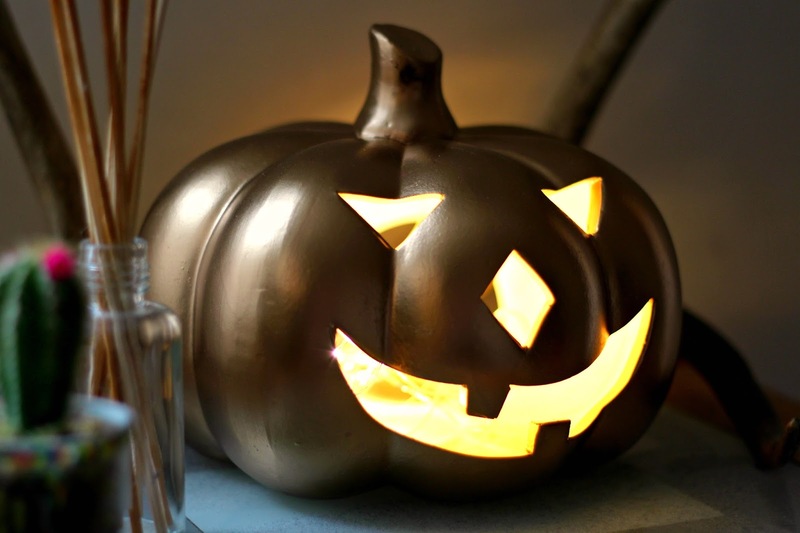 If you want to do this project, you'll only need the pumpkin, some spray paint in your choice of colour and the battery-powered fairy lights, so it would cost you less than £10 for something that will last all season and even into next year! This project requires a little bit more work, but the end result is just fab. If you're the type of person that saves jars, then this could be the one for you! All I did to achieve this effect was spray paint the inside of two jars in a dark blue and paint on a design in black. Some areas needed two coats, but once it was all dry, I popped a set of my fairy lights in each jar to illuminate my spooky scenes. 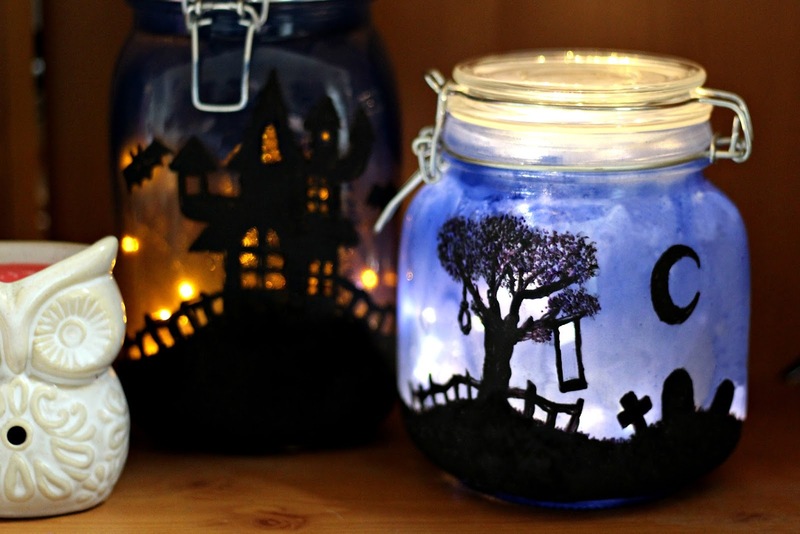 I particularly love the haunted house jar with the amber lights - it gives the impression of a moody sunset or fire. You could paint absolutely anything on to your jars (there's some fab inspiration on Pinterest) and they'd also look great with purple spray paint. Again, this is the perfect alternative to using candles! If you've got a lot of spare time on your hands and have a thing for ribbon, then this wreath is right up your street. I'd been thinking about making an autumn wreath for a really long time, but as soon as I saw all of this adorable ribbon in my local craft store, I just had to buy it. I also bought a wreath form with them and a polystyrene skull ornament. First of all, I painted my skull with two coats of black paint. I had considered adding a bit of glitter, but I'm glad I didn't. It would've been a little bit O.T.T.! Once he was dry, I tied him on to the wreath form, then wrapped my strips of ribbon around the metal and tied them in double knots at the back. Once the whole thing was covered in the strips, I trimmed off the excess so I had a nice and neat circle. Of course, this absolutely does not need fairy lights, but I think that they really add something, especially the amber set, so wrap those fairy lights around your wreath and enjoy the way it looks! Again, there's some much inspiration for Halloween wreaths on Pinterest - some of them are super extravagant and absolutely dwarf my little stripy circle! Who knew that fairy lights weren't just for Christmas!? There's so many great ideas for how to use your lights on the Festive Lights website, so definitely give it a look. There's things for weddings, birthdays and general home decor as well as much more! I had so much fun creating all of these Halloween bits and even more fun looking at all the gorgeous lights, so I'll say a big thank you to Festive Lights for teaming up with me! I'd love to know if any of you have any other Halloween fairy light ideas, so let me know in the comments. This post is a collaboration Festive Lights. All thoughts and opinions are my own. I loved this post I'm feeling inspired now. 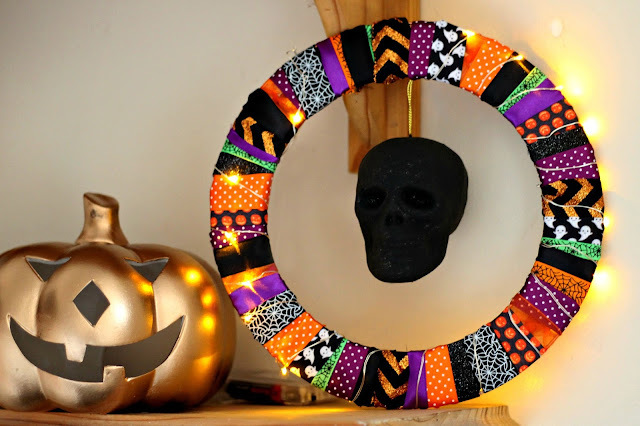 I think, I'm in love with Halloween wreath and I like the jar crafts. Oh thank you, Sarah! I think the wreath is probably my favourite because I love playing with ribbon, but the jars have a great effect on a room! Thanks for the comment, Sam! It's definitely not too early to get the decs out!